It's been awhile since I've blogged, so I need to get back on the horse. I know blogs drive SEO and help business, but business has been so good, I haven't had much time to write and post. Last Thursday I presented my photographic lighting program "One Light, Two Light, Red Light, Blue Light" to the Dutchess Regional Professional Photographers (DRPP) in Fishkill, NY. Here is the write-up that will go out with their President's Message. Writeup and photos of me provided by Steve Lynch, DRPP. Used with permission. Patrick Luke, President of the Professional Photographers Society of New York State, (PPSNYS) gave an excellent presentation on Studio Lighting and also "On Location" lighting techniques using One Light, Two Lights . . . and up to Five Studio Lights with three reflectors. His presentation was both informative and very entertaining. Although it was a bit lengthy - ending at about 9:45 PM . . . NO ONE left the meeting early! Pat specializes in photographing High School Seniors in the Rochester, NY area, and he said that he always interviews them beforehand to find out their likes and special interests - athletic sports team, or perhaps plays a musical instrument - and then he personalizes their photo shoot accordingly. For example, one High School Senior was on the school's soccer team, and so Pat set up his "On Location" lights on the soccer field and then had the student's mother throw the soccer ball up in the air, and the Senior jumped up about 4 or 5 feet into the air, and did a "Scissor Kick" . . . and Pat looked at the back of his camera and said: "OK Perfect - GOT IT" ! ONE SHOT - Picture Perfect ! ! ! See photo attached - which was "Copiedright" without permission from Pat's Website. Unlike most HS students who get their senior pictures done before they start their senior year of high school, Charlie (like his brother before him) came in to the studio near the end of his senior year for his senior portrait experience. And instead of talking about college searches and the applications they are filling out, we got to talk about him attending Virginia Tech in the fall. Charlie is an avid hockey player, as you can see by the variety of jerseys that he brought in for his session. He is easy-going and quiet, and open to whatever we planned on doing during his session. He dressed up sharply, sported the casual look nicely, and really enjoyed the hockey part of the program, when we went to town on all the different uniforms: Fairport HS, Perinton Blades, and Jr. Amerks. Reed will be entering his senior year at Pittsford-Sutherland HS in the fall, and came to the studio this spring for his senior portraits. He was a late but worthy addition to the 2016 Model Team. Reed is a mid-fielder on Pittsford-Sutherlands very successful boys' lacrosse team which achieved a national ranking during this past season. He had a very clean look, and photographed really well. The most surprising thing about his look is that, depending on which side of his face you were looking at, he either looked like Matt Damon or Leonardo DiCaprio. I guess if you have to look like a couple of actors, those are two that can't miss. If you know Reed and are interested in senior pictures, talk to him about her experience at the studio and ask him for a Gift Card good for 20% off a senior portrait session fee at Luke Photography. 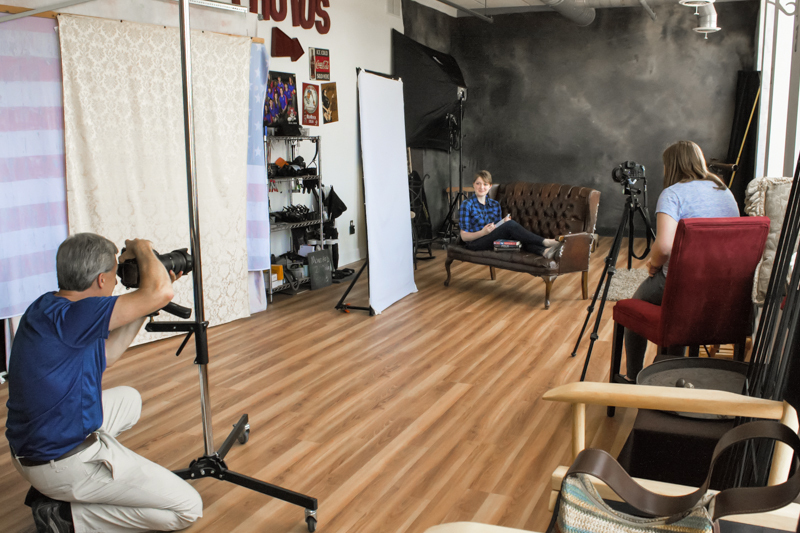 One of the camera rooms at the Luke Photography studio is a 700 sq.ft. daylight-lit room on the 2nd floor of the building with five 7 ft. tall windows along one wall (west-facing). On a normal day, the light in this room is perfect for portraits...very soft, but directional, and I get great exposures shooting at 800 ISO, f2.8 at approximately 1/400th of a second (on average). However, on darker cloudy days, there is at least a two to three stop difference in the light....enough so that I am not happy with the settings I have to use to get a proper exposure. I have another camera room that is outfitted with strobes, and that is where I prefer to keep them, and I prefer to shoot natural daylight in this 2nd camera room. I have a Larson 4 ft. x 6 ft. soft box permanently attached to a DIY rolling base in the daylight camera room, but I'd prefer to shoot continuous light instead of strobe, so I needed a continuous light source, but I didn't want another piece of equipment in the room, so I decided to make a continuous light adapter to fit inside the 4 ft. x 6 ft. soft box, without affecting its ability to be outfitted with a strobe simultaneously. I designed a hexagonal plate made out of 3/4" thick plywood that could be securely attached to the base plate of the soft box, with a hole in the middle that would allow the strobe to be attached and used without affecting the quality of light. I drilled eight large holes that would accept rubberized light bulb sockets (purchased at the local big box hardware-home goods emporium). I glued pieces of plywood to the back side of the wooden base plate so that it would sit approximately one-and-a-half inches away from the metal base plate to allow room for the wiring. The frontward-facing side of the wooden base plate was covered with aluminum tape, so that it had a reflective surface and would bounce any light forward. The rubberized light sockets were epoxied into the holes and allowed to dry. The light sockets were all wired together in series. I purchased a 6 ft. extension cord with male and female ends that matched the cords used by the Alien Bees strobes I already use in the studio. The male end of the extension cord was cut off, and the cut end was wired to the rubberized light sockets, so that the female end hung free and would be used to connect to the strobe power cords that get plugged into the power source. The light was provided by 60 watt LED bulbs that are rated at 5000K. The Cree bulbs that I purchased had a fairly high color rendering index (CRI) which indicates that it produces more full-spectrum light. Bulbs with low CRI only provide light from a few areas on the ROYGBIV spectrum, and while the light may still look white to our eyes, the fact that it uses light from only a few areas on the spectrum will result in spotty and often very poor skin tones. I did not need to buy the strongest wattage bulbs I could find. I only needed bulbs that would get me back to my preferred natural day light exposure and make up the 2 or 3 stops of light that was lost on a cloudy day. After the wooden plate was screwed to the metal base plate and the soft box was assembled, the bulbs are screwed into the light sockets, and front diffusion screens are re-applied to the soft box. Once the strobe is re-attached to the metal base plate of the soft box, the strobe and continuous light adapter can be used independently of each other. If I need to use the strobe, the power cord is attached to the strobe. If I want to use continuous light, I power down the strobe, unplug the power cord, and plug it into the female adapter for the continuous light source. Total cost for the project was less than $100 USD, and most of that budget was eaten up by the LED bulbs. I already had the wood, aluminum tape, and wiring, so the only other purchase was the rubberized light sockets and the extension cord. The continuous light is all but identical to the light provided by the strobe in the soft box. I created a custom white balance for the continuous light adapter using the Passport Color Checker, so if there are any disparities in the white balance and color spectrum, they are normalized. Now whether I am shooting in this room using natural ambient light coming through the windows or using the continuous light adapter on a particularly cloudy day, the camera settings are identical, without the need for any other equipment on the floor. Spencer is a junior from McQuaid HS, and is a Luke Photography Model Rep for the Class of 2017. He plays hockey and football, and is interested in photography. Spencer has the nice combination of being handsome, confident in himself, and comfortable in front of the camera. 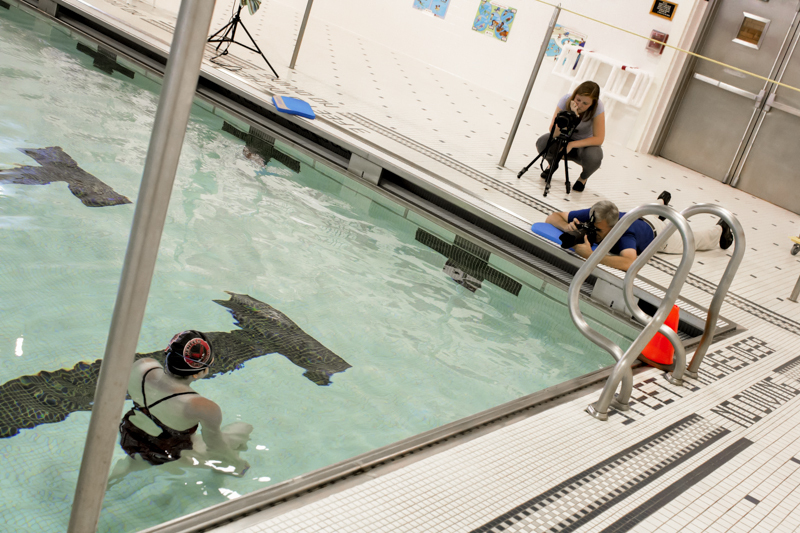 His interest in photography made the session even more fun, as it became a learning experience for him. His wardrobe ran the gamut from his just-rented junior prom tuxedo to casual t-shirts and then a football uniform. Like most teenagers, he enjoys listening to music and playing sports with his friends. He is a Netflix-aholic, and got to spend two weeks traveling in India last summer. After high school, he is interested in attended college for pre-med, and his dream job is as an orthopedic surgeon. When asked about why he wanted to come to Luke Photography, he stated that he loved the variety of photos that come out of the studio, and he like the encouraging environment that he heard about here. 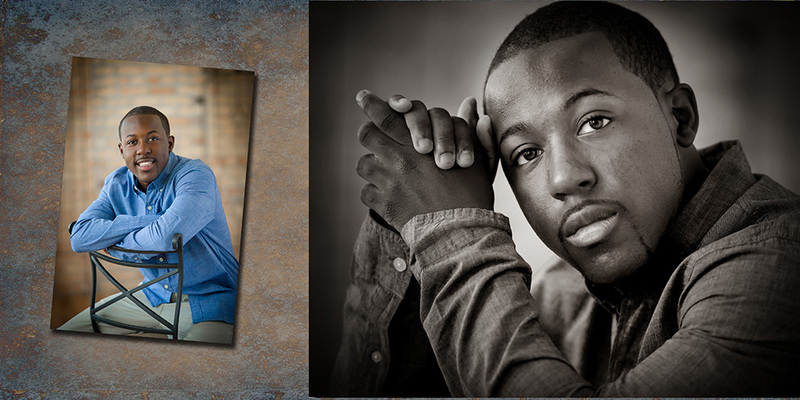 If you know Spencer and are interested in senior pictures at Luke Photography, talk to him about his experience at the studio and ask him for a Gift Card good for 20% off a senior portrait session fee at the studio. 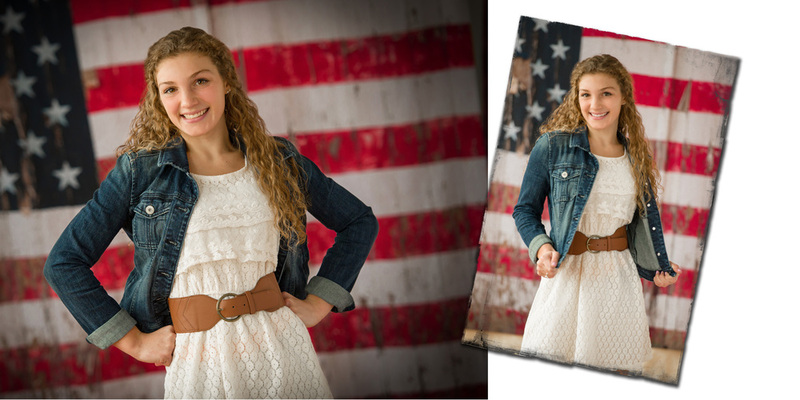 Holly is a HS Mode Rep. for Luke Photography from Fairport HS. She carries a straight A average and spends her free time at the dance studio, where she's been taking lessons since she was 4 years old...tap, jazz, lyrical, ballet. Oh, and she's my daughter. Having photographed her before...obviously...we really challenged ourselves to do something that we hadn't done before. We started her session outdoors, working against sprinkling rain and a drizzle at an old industrial building near the studio. Orange and this olive green are somewhat opposite each other on the color wheel, and the contrast of these complementary colors produces contrast and energy. She loved her junior prom dress, so we made sure to include that in the indoor portion of her session, including some of favorite dresses and "comfy" clothes. She looks especially cute in purple, so that was a winner for both of us. If you know Holly and are interested in senior pictures, talk to her about her experience at the studio and ask her for a Gift Card good for 20% off a senior portrait session fee at Luke Photography. The fact that she is very studious and focused is very representative of the fact that she wants to become a doctor. But ask her where her favorite place is, and she'll say "the beach", which suggests she can relax and enjoy life too. 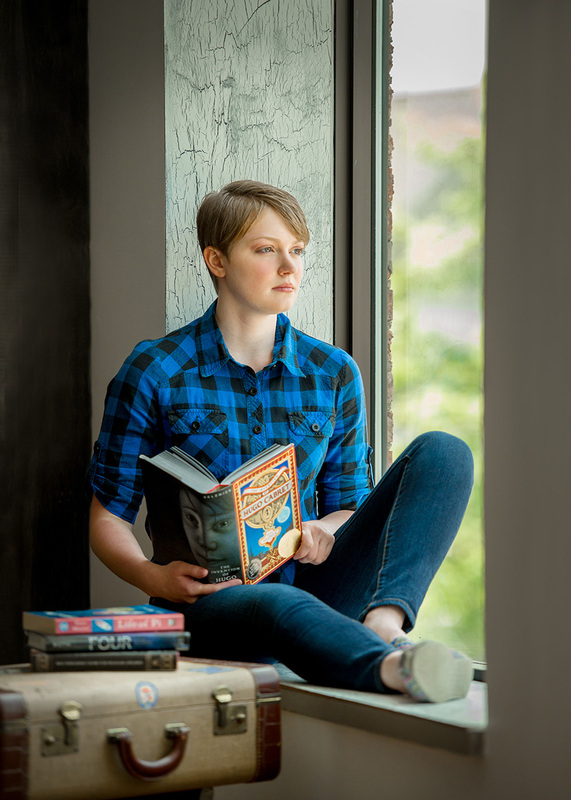 As one of four girls in the family (including a twin sister), Emily enjoys family and, other than her phone, is the one thing she can't live without. Emily and her twin sister had back-to-back sessions, and we made sure that they each had very different photos, and if you look at last week's blog post, you'll see that each set of their photos is very different from each other. And although they are identical, I found one way to differentiate one from the other by their faces...but I'll keep that a secret for now. If you know Emily and are interested in senior pictures, talk to her about her experience at the studio and ask her for a Gift Card good for 20% off a senior portrait session fee at Luke Photography. 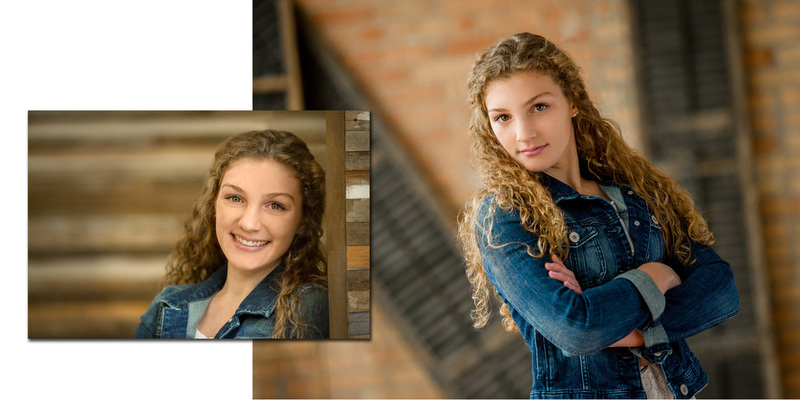 Rebecca is a Class of 2017 HS Model Rep. for Luke Photography from Fairport HS. She plays field hockey both for Fairport's varsity team and a travel team, carries a straight A average...AND plans on a pre-med major in college. Beauty, brains, and ambition. This beautiful girl has an identical twin who's session immediately followed Rebecca's, which made it extra interesting because the studio shoots every session differently, even with two identical girls coming in back-to-back. I had photographed Rebecca several times on her field hockey team, so we were familiar with each other, which made the session comfortable from the start. Combine that with Rebecca's easy-going nature, and we breezed through a number of different outfits and sets. And just look at the last photo in this set...such soulful eyes. If you know Rebecca and are interested in senior pictures, talk to her about her experience at the studio and ask her for a Gift Card good for 20% off a senior portrait session fee at Luke Photography. Erica is a junior from Fairport HS who has long, curly blonde hair which framed her face beautifully. She had two completely different looks, depending on whether she was smiling, or had a more serious look. Her face absolutely lit up when she smiled, and I saw a happy girl through the viewfinder. However, in several of the photos when she had a more serious look, she appeared to be a 25-yr. old model. Her makeup was done by Nikki Mitrakos, from Love and Style On salon. Her wardrobe varied from rich colors to soft pastels, which all looked good on her. The rich colors in the burgundy-colored top and even the denim jacket provided a punch of color. The mint colored sweater complemented her lighter complexion and blonde hair. The one common theme through all of the clothes was that all of it had texture, which added dimension and depth to the portraits. If you know Erica and are interested in senior pictures, talk to her about her experience at the studio and ask her for a Gift Card good for 20% off a senior portrait session fee at Luke Photography. 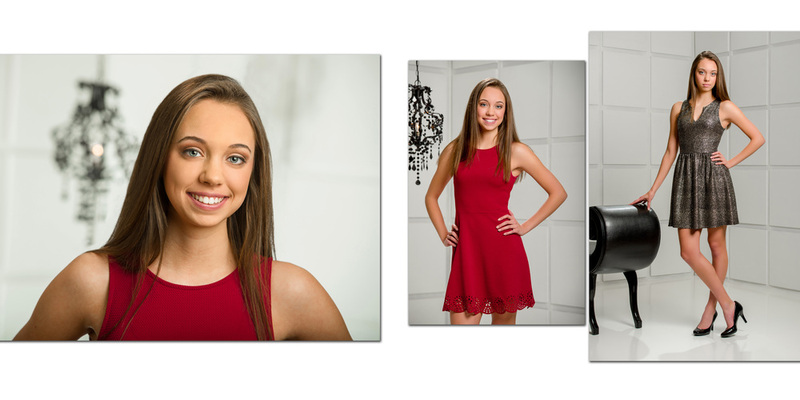 Emily is a Class of 2017 HS Model Rep. from Penfield HS who had been planning on beinga Model Rep. since her brother came to the studio two years ago for his senior portraits. Emily has a great casual wardrobe, and everything that she brought in worked, and worked well. Most of her clothes were in the cool end of the spectrum (e.g. blue, purple) and they worked especially well with her dark hair. Emily is a crazy good lacrosse player who plays both for the Penfield varsity team and the Lady Roc summer program. She's "fast when she wants to be", and was game for some dramatic photos in her lacrosse warm-ups. We are looking forward to photographing her this summer in her uniform on the turf field at Penfield HS. If you know Emily and are interested in senior pictures, talk to Emily about her experience at the studio and ask her for a Gift Card good for 20% off a senior portrait session fee at Luke Photography. Acadia is a Class of 2017 HS Model Rep. for Luke Photography from Victor HS. Prior to her senior portrait session we discussed going outdoors in the snow during her session, and she said that she was "up for anything". Little did I know this meant I was going to get hit with a snowball. Cadi, as her friends call her, brought in several changes of clothes in her typical "BoHo" style, which all photographed really well. As we usually do, we pick the backgrounds for the session based on the clothes the senior brings in. You can't plan on pre-conceived ideas if they won't match the color or style of clothes that the subject is going to wear. Fortunately, she brought in a royal blue blouse which really made her eyes "pop". By using a plain white background, it lets her eyes take center stage....they are the first thing you see in those images, and it's difficult taking your eyes off of hers. Cadi has a nice, easy smile which looks amazing in those photos, but take a look at the more serious look she shows. Just a little bit of sass, just a little bit of confidence, just a little bit....of Cadi. 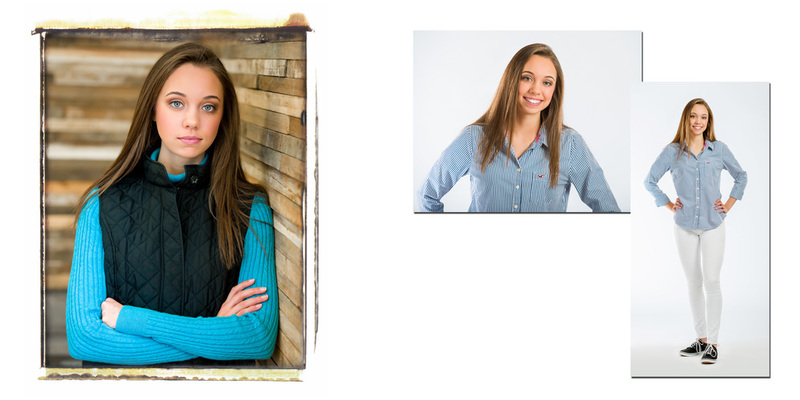 Nicole is a fun-spirited HS Model Rep. from Greece Odyssey HS, who searched out the studio to be a model rep. this year. She is a great point guard on her varsity basketball team, and is a very spirited player and leader. She was an absolute joy to have in the studio and has such a good sense of humor...we had a great time during her session. Some people just have a fun approach to life, and Nicole is certainly one of those who has a good handle on it. If you look at her eyes in these photos, you'll see an amazing amount of color and detail. And when the light is steaming in her eyes, as it was in some of the outdoor winter photos, there is a CRAZY amount of color in those eyes. 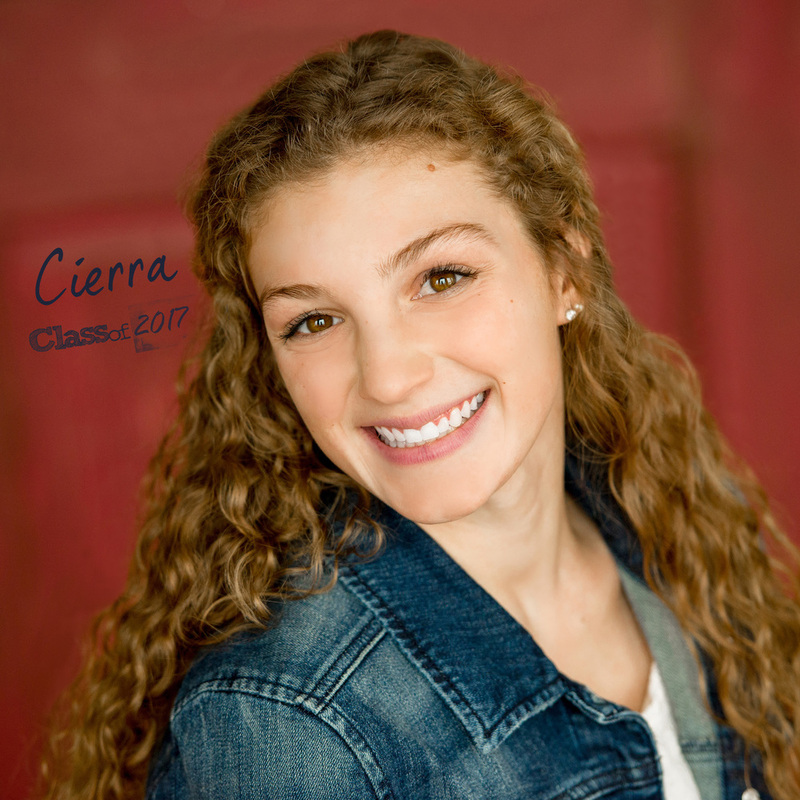 Cierra is a junior from Palmyra-Macedon HS who has some of the most naturally beautiful curly hair I've seen. She starts on both the varsity basketball and lacrosse teams, and has already committed to playing lacrosse at Niagara University when she graduates. She has a fun, bubbly personality and became so engaged in the fun and spirit of her session. You can see this in several of these images, because you just can't fake that perfect of a smile. And just how many different looks could she have given during her session? Sarah is a HS Senior Model Rep for Luke Photography from Fairport High School. I have known Sarah since she was 5 years old, as she was the 2nd student thatwalked into my daughter's kindergarten classroom on the first day of school, and they became friends immediately, as young kids do so easily. Sarah wasn't having the best of weeks when she came in for her session. But it turned out to be a good escape for her and she was so relaxed when she was in the camera room. Sarah has the biggest blue eyes, and they show up incredibly in many of these images. 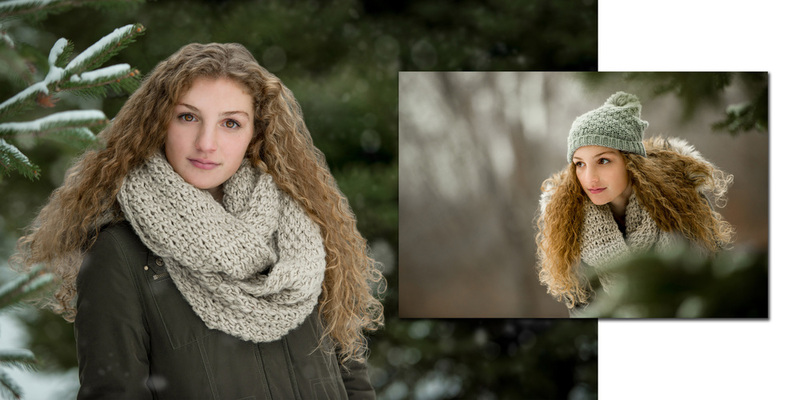 My favorites are the first and last images: the bluish-green background in the first image and the grey background of the outdoor photo in her winter hat really bring out the color of her eyes. 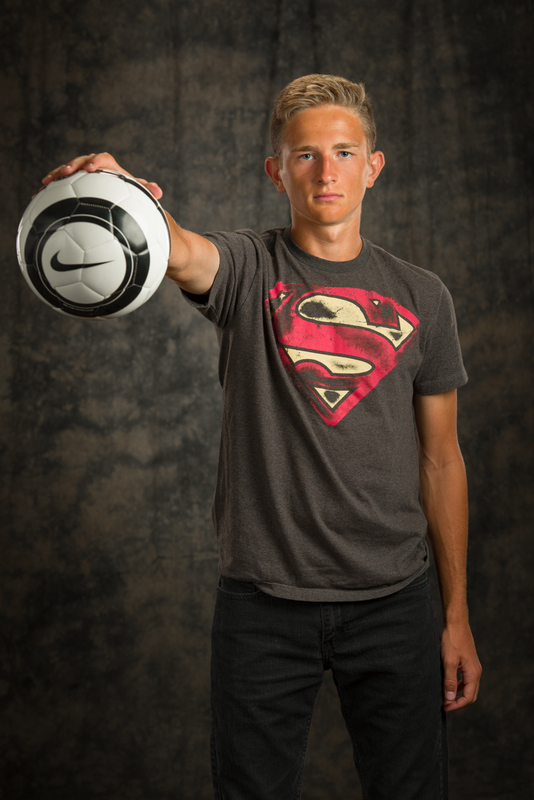 Tommy is another Fairport athlete that came through the studio this year for senior portraits. 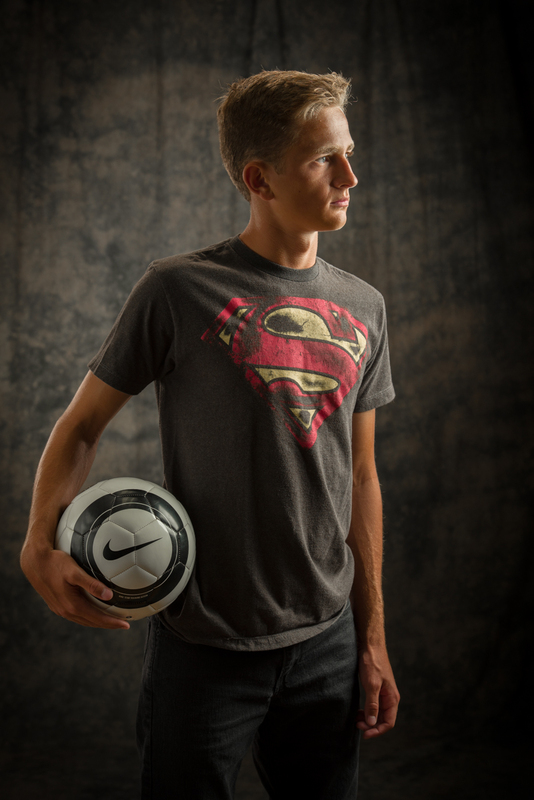 He is a soccer player, and was one of very few juniors that made the varsity team last year. He is the consummate team player, and makes the team better through good chemistry. In addition to that, he is a very sharp dresser, as evidenced by the nicely-fitted suit he wore to the session. And when he pulled out a Superman shirt that he thought he wanted a photo with...I just had to have a Clark Kent/Superman photo, and Tommy was game for it. A little playing around, and we ended up with a crowd-favorite photo. Jahadi just entered his senior year at Fairport HS and is going to start...and end...the year as one of the star players on the varsity football and lacrosse teams. But it doesn't begin or end with sports for him. 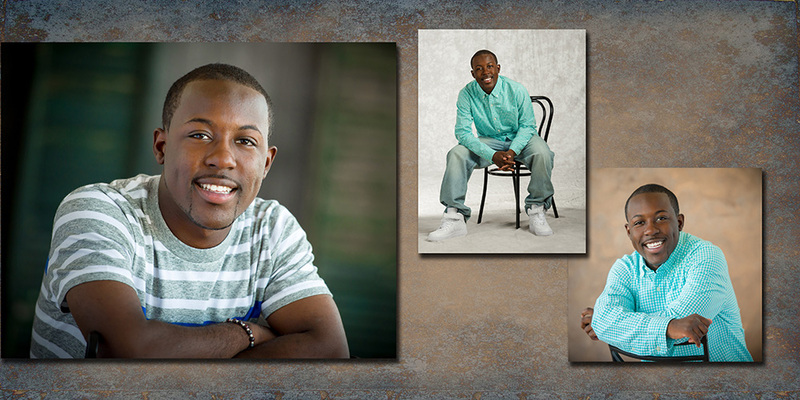 Jahadi is one of the nicest, respectful, and laid-back students that have come through the studio for senior portraits. My wife taught him in middle school as an 8th grader and had nothing but good things to say of him. I can't imagine anyone saying anything bad about him. As a junior running back last year, Jahadi reeled off a 68-yard touchdown run on the 2nd play from scrimmage in the first quarter of a Homecoming win. And had it not been for an injury, he would have run amok through the lacrosse defenses last spring. And this year, I expect big things from this well-liked young man.